Ear wax is a substance produced by the glands situated within the ear canal. It has the task of stopping small dust particles and bacteria from reaching the eardrum which could possibly cause additional issues, including damage to the eardrum itself. It is natural to have wax in the ear, in-fact we need some to keep the ears healthy, lubricating the skin and preventing dust and bacteria from entering. The amount of earwax that is produced can vary a great deal from one person to another. In most cases wax will leave the ear naturally, however, sometimes this doesn’t occur leading to a build-up of wax, which may lead to discomfort, pain and hearing loss. In this instance, you will require some help to completely remove it. How do I know I have a build up of ear wax? Remember, you should never ignore these symptoms or attempt to remove ear wax yourself by pushing anything into your ear. The lining of the ear is extremely delicate and can be damaged very easily. Microsuction is a procedure where we use a binocular operating microscope to remove the excess wax from your ear. The micro-suction service we offer allows better magnification and depth perception. In turn, it’s much easier to look directly into the ear canal. Using a low-pressure sterile suction device we can then continue to remove the ear wax with precision. On occasion, we may need to use additional instruments during the procedure. However, using microsuction means that we have a clear view of the ear canal which will ensure the process is always comfortable. Patients and medical staff highly recommend micro-suction as their chosen method of wax removal. Other options which include ear wax softening drops are no longer necessary using the wax removal method. In most case, the removal of wax can be removed safely in just a matter of minutes by Nantwich Hearing Centre. How Much Does Microsuction Cost? 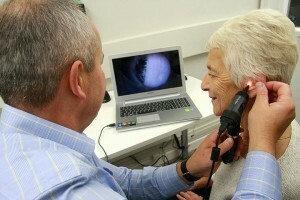 Here at Nantwich Hearing Centre, we offer this service at £45.00 for 1 ear or £70.00 for both ears. We can usually arrange appointments within a week. Please feel free to contact us if you need any further information or help on microsuction wax removal. We also use an alternative method of dry removal and low-pressure irrigation. The procedure is carried out using an electronic ear irrigator where the pressure is easily controlled. This is safe and extremely effective in the removal of earwax. We can usually offer appointment times at short notice to suit you. An appointment typically lasts 30 minutes but can take up to an hour.